A listing over at Amazon reveals Corsair is very close to launching its Obsidian 1000D. This will be the new flagship model, the current Obsidian 900D was brought to the market in 2013 so it's definitely time for an update as a lot has changed over the past five years. 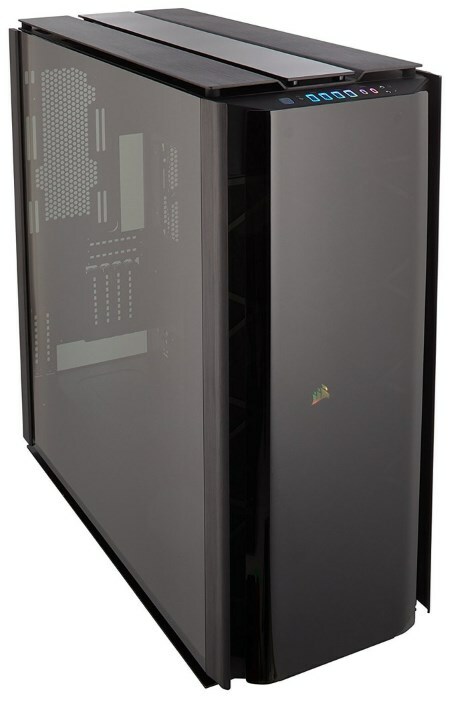 The Obsidian 1000D supertower is priced at a massive $499.99, it's made from steel and has a matte black aluminium front. It features tempered glass side panels and integrated RGB LED lighting plus the Corsair Commander Pro fan and lighting controller. This massive case measures 693mm x 307mm x 697mm and weighs a huge 29.5kg. There's room for a gargantuan amount of cooling in this case. The front alone fits eight 120mm fans, and then you can also mount three 140mm fans in the top and two 140mm fans in the rear. Alternatively, you can mount up to two 480mm watercooling radiators in the front, and a 420mm radiator in the top. There are eight expansion slots, six 2.5" storage slots and five 3.5" storage bays. Motherboards of up to E-ATX size are supported and you can also install a secondary Mini-ITX motherboard. Besides an ATX power supply, there's also room for one SFX-L PSU so you can effectively build two systems in this case. The front-panel features four USB 3.1 type-A, and two type-C ports; in addition to audio jacks. Connectors are framed by RGB lighting diffusers. The case is highly modular, and you can either choose between storage-heavy configurations, or cooling-heavy configuration that frees up room for multiple liquid cooling loops. The rear I/O can be configured to be perpendicular to the plane of the motherboard with 8+2 slots, or parallel to its plane, with 5+2 slots.